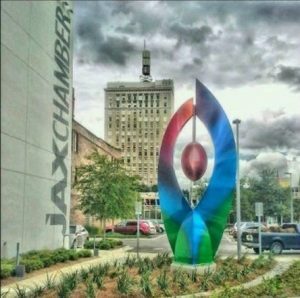 Rockaway bid on and was awarded the landscape installation contract for the jax chamber building. The project implemented the design by Marquis Halback. The landscaping uses a mix of drought tolerant and Florida friendly plants combined with gravel strips compliment both the surrounding landscaping and the newly installed sculpture. Rockaway also converted the existing high volume irrigation to low volume drip irrigation suitable for the new plantings. Challenges included coordination with other site contractors as well as the installation of the sculpture. We were very flexible with our timing and were delayed numerous times by other vendors. In the end a modern, minimalist landscape was installed and beautifully highlights the artist’s sculpture.